Pre-Event focus of 2019 is Water management! Welcome to join us on June 25th 2019.The program is under construction but will be updated here shortly! Below you can take a look at the program for Pre-Event Borgeby 2018! 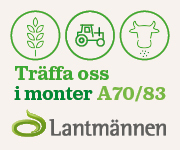 Never before have Swedish farmers had such great opportunity to practice precision cultivation. Information and technologies are available - but how do you best utilize the opportunities in your farm? 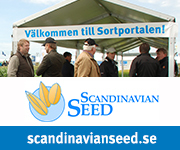 During this year's pre-event we will host international guests and Swedish specialists in precision cultivation. The 2017 Pre-Event Borgeby was sold out, and this year, the number of seats to Pre-Event Borgeby is limited, do not forget to secure your seat if you are interested! Tickets are sold at Ticketmaster. We will look back at a few milestones in the dawn of precision cultivation and then make an overview of today's solutions. But where are we heading? A lot of emerging concepts are formed in the border between digital technology, robotics, artificial intelligence and sensors. Artificial intelligence is already used to analyze drones for the purpose of detecting potato leaf mold. It is also used to predict crops. When companies like IBM make a major contribution to farming, it's no wonder if things start to happen. In this presentation we will get the latest knowledge from a large German precision cultivation project. Imke is working on a research project that spans 300 hectares on the farm Gut Helmstorf in Schleswig-Holstein. The project team she manages works with site-specific and custom-made efforts and examines what it means in practical work on the farm and how the return is affected. Can site-specific efforts reduce production costs, and increase the yield of, the cultivation? Jacob runs plant breeding with his brother in Holland. Their biggest crop is potatoes on 550ha of own and hired land. Precision cultivation is a leader in the business and, with the help of this, they have increased their growing net. Reduced costs and higher yields are the results of precision cultivation on the farm. Jacob collects large amounts of data from his cultivation, from below and above ground. For example, the field of sensor is scanned at every time the plant protection syringe runs out of the field. These data are supplemented with weather data, any satellite data and data from druners, then calibrated against own test farms and evaluated by the farm's employee data analyst. The lecture deals with how we handle our in-data and how our own in-data from fields can be combined with field trial data. What background data can we use to control our cultivation? How do we handle year-to-day variations, soil and crop mapping? The challenge lies in combining data, technology and biology equally skillfully. In Borgeby Field Days' famous "Gropen" is invited to a unique premiere show for the year with extra time for questions and discussions underground. Display of Precision Model Demo. It will be an exciting view in the middle of the cultivation with the most modern precision cultivation technology available. Daniel Finnfors and Håkan Håkanson, HIR Skåne are in this view. What? Pre-Event Borgeby. Focus on precision cultivation.